Do you find yourself constantly adjusting the volume of your phone's ringtone, or wishing that the annoying buzz of your phone's vibration could be toned down a little? Looking to solve all of your ringtone/vibration woes (while making sure you don't miss a call), Michael Pardo has introduced RingDimmer to the Android Market. 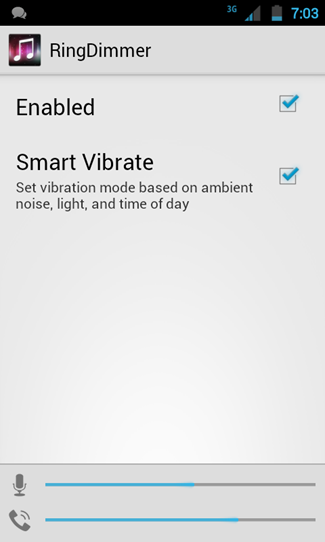 The app adjusts vibration intensity and ringer volume based on ambient noise, ensuring that you never miss a call, and never have to be disrupted by an inappropriately loud ring tone. The first thing users will notice about RingDimmer is its simple interface. When I say simple, I mean the entire app consists of one screen and two checkboxes. There's no other interface whatsoever, making RingDimmer perhaps the most straightforward app in the history of the universe. While a simple interface is great, the lack of user controls is also my biggest complaint with RingDimmer. While its functionality is a fantastic idea, I can't help but think that users could take some part in customizing the app's "smart" control of ringers and vibration intensity. On the plus side, RingDimmer does exactly what it claims to do, taking live readings of ambient sound utilizing your phone's microphone. 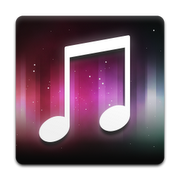 The app, when open, will also display the current ringtone volume setting. Having an app constantly monitoring microphone input sounds fairly battery intensive, and the impact RingDimmer may have on a phone's battery life has yet to be seen, but the developer assures users that the app is "designed to conserve your battery." Overall the app is extremely easy to use, and does exactly what it says. For those that find the idea of automated ring volume and vibration intensity control appealing, RingDimmer is available for a mere $0.99 from the Android Market. Given its simple, reliable functionality, I'd say this app is definitely worth checking out, and shows real promise in becoming an incredibly useful solution for those who can't be bothered by constantly adjusting ringer volume as they move through their day.